Burlingame, CA – California-based assistive technology (AT) program, Ability Tools, plans to host a day of presentations from up-and-coming innovators of technology that supports people with disabilities at Home Safety Services in Burlingame on Thursday, August 30, 2018. Presenters include the high school student-engineers of Project Invent and its Founder and Executive Director Connie Liu, Pants Up Easy CEO and Inventor of, Doug Pearson, and the owner of Home Safety Solutions, Martin Simenc. The event is free and open to the public for those who register online. "Ability Tools is dedicated to connecting Californians with disabilities to resources, which includes people with innovative solutions," said Emily Flynn, Ability Tools Program Coordinator at the California Foundation for Independent Living Centers (CFILC). "We are delighted to have teenage engineers of Project Invent in our network of AT advocates." The high school student-engineers of Project Invent will be leading an interactive training with a community partner who is blind. They will be demonstrating devices that they developed specifically for his challenges with limited vision. Liu explained that she started Project Invent as a "catalyst for good" that later grew into an after-school program. "Project Invent started out of a frustration with an education system that prioritizes high test scores rather than real-world problem-solving," said Liu. "Project Invent students are more than just learners; they are change makers." "I had no engineering experience prior to being a part of Project Invent," said 16-year-old Maddie Park, 11th grade student at Nueva School. "Now I feel very comfortable programming, wiring, 3D printing, soldering, and more." Park feels that her involvement with Project Invent has strengthened her design thinking skills and taught her so much about how to interview people with empathy. She finds that meeting with community partners to understand the needs of the people who will be utilizing their inventions most rewarding of all. The Ability Tools Bay Area training is one of many events throughout California, providing resources and education on assistive technology for people with disabilities. For media interested in attending the event, please email kyla@cfilc.org for access. Media Contact: Kyla Aquino Irving, (916)325-1690 Ext. 304. 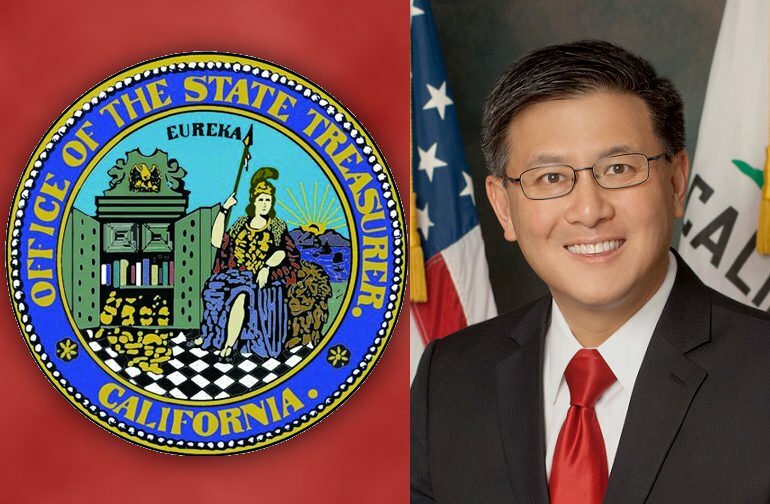 Photo of State Treasurer John Chiang side by side with the California State Treasurer Seal. Sacramento, CA – California State Treasurer John Chiang announced the selection of TIAA-CREF Tuition Financing, Inc. (TFI) to administer the California Achieving a Better Life Experience (CalABLE) Program. "TFI's selection means we're one step closer to turning on CalABLE's 'Open for Business' sign," said State Treasurer John Chiang. "TFI's expertise and oversight are a welcome help in reaching Californian's with disabilities and their families, who will soon be able to save up to $15,000 a year, tax free, without jeopardizing their federal and state assistance." Currently, savings for individuals receiving Supplemental Security Income (SSI) or other public benefits have a $2,000 resource limit. Once a beneficiary is determined to have more than this $2,000, their benefits may be suspended until savings fall below that level. CalABLE - the state's version of the federal ABLE Act - allows people with disabilities to establish a tax-advantaged savings account in which they can save up to $15,000 per year, up to a total of $100,000, without jeopardizing their ability to continue to receive existing public benefits. Earnings into CalABLE accounts are not subject to federal income tax or California state income tax, so long as the earnings are spent on a broad range of disability related expenses. "We are excited to see the CalABLE program move forward in providing people with disabilities the opportunity to build their futures," added Christina Mills, executive director of the California Foundation for Independent Living Centers. "There are very few ways for people in our community to save money without penalties. Opening a CalABLE account will be a game-changer for individuals with disabilities, and parents of children with disabilities, who have been limited by programs and services that prevent us from saving and becoming more independent." TFI was selected to manage the new CalABLE program by a vote on Tuesday by the CalABLE Act Board, based on the firm's low costs, proposed investment portfolio that offered simple choices for enrollees with clear preferences, and the simplicity of its program for those new to such a savings program. TFI is a national leader in providing program management services for college savings plans and currently serves as the manager for California's successful ScholarShare 529 college savings program. • Select from easy to understand investment options. Chiang added, "No one should have to fear losing their disability benefits because they decided to save wisely and invest in their future. This program will help ensure no Californian with a disability will be penalized for thinking ahead." For more information about CalABLE visit https://www.treasurer.ca.gov/able/resources/factsheets/factsheet-en-us.pdf or call 916-653-1728. View the original article at www.oc-breeze.com. Sacramento, CA – After a statewide search the California Foundation for Independent Living Centers (CFILC) Board of Directors has selected Christina Mills as its new Executive Director. A lifelong disability rights advocate, Mills is a champion for families and youth with disabilities across California who desire to lead full, productive lives on their own terms. "Christina has demonstrated the ability to lead, and to ensure that CFILC continues its history of building the capacity of Independent Living Centers," said Board Chair Ana Acton. "She'll work in collaboration with allies to create positive public policy changes that benefit people with disabilities of all ages." Mills joined CFILC in 2006 as the Statewide Community Organizer and has served as Deputy Director since 2010. She brings broad professional and personal experience, both as a seasoned and skillful advocate, as person with a disability, and as a parent of children with disabilities. "Having lived on SSI benefits for more than half of my life, I know how challenging it can be to achieve autonomy and self-sufficiency," said Mills, 40. "We have a great deal of work to do in our society to shift the narrative about disability from one of pity and tragedy to something more reflective our inherent power, value and resilience. My vision is to raise the visibility of California's thirty-nine million disabled youth, adults and seniors and create opportunities in places where our community is traditionally marginalized." In her new role as Executive Director, Mills will bring intergenerational and intersectionality opportunities forward in Independent Living and Disability Rights, while working in solidarity with other social justice organizations who value human diversity. Born in San Diego, Mills began her post-secondary education while simultaneously pursuing a career in disability rights. In 1998, she served as a field coordinator for The Dayle McIntosh Center located in Orange County. She later worked for San Diego-based Access to Independence for six years. In 2001, Mills was appointed by then Governor Gray Davis to the Sate Independent Living Council. As a young professional she was active in several leadership activities including National Council on Disability, Youth Advisory Committee Chair, Youth Consultant for the National Family Voices and Kids as Self Advocates (KASA) project. She became a Student Delegate for the California Youth Leadership Forum for Students with Disabilities in 1995, and has been a supporter of the program ever since. Christina's passion for offering youth leadership opportunities for others led her to become Co-founder of CFILC's youth program, YO! Disabled and Proud. In 2008, she was awarded the National Council on Independent Living Region IX Advocate of the Year. In 2011, she received the California Coalition for Youth Sue Mathewson Mentoring Award and was inducted into the National Susan M. Daniels Disability Mentoring Hall of Fame in 2016. Christina serves on the board of the Disability Rights Education Defense Fund (DREDF and is a State Board of Education Appointee to the Special Education Advisory Commission of California. Christina proudly identifies as disabled. Her favorite poem written by Laura Hersey is, "You Get Proud By Practicing." Christina is a mother of two children. Her young daughter Olivia passed away in 2016. Christina's husband and son keep her busy with gardening, traveling when she's not working or volunteering. San Francisco, CA – SAN FRANCISCO, April 7, 2017 - The Silicon Valley Independent Living Center (SVILC) opened its doors in San Jose to host a celebration together with the California Public Utilities Commission (CPUC), Senator Jim Beall (D-San Jose), the California Foundation for Independent Living Centers (CFILC) to provide demonstrations of Voice Options, which offers iPads with speech applications at no-cost to people with speech disabilities. Voice Options is a pilot program of the CPUC associated with Assembly Bill 136 (Beall, 2011) and administrated by CFILC. The program loans iPads with speech applications to Californians who are not able to speak, or who have difficulty speaking, so they can determine if using an iPad increases their ability to communicate. "As an Assemblymember in 2011, I authored AB 136 because I wanted to help bring Speech Generating Devices to people with speech disabilities," said Senator Beall. "I am very happy to see that the Voice Options program is up and running and providing assistance to those who participate. I hope that San Jose consumers will visit the Silicon Valley Independent Living Center for an iPad demonstration to see if using the device, along with a speech app, increases their ability to communicate." "This is a very important program because of the potential benefits it brings to those who participate," said CPUC Commissioner Clifford Rechtschaffen, who is assigned to the CPUC's Voice Options proceeding. "Using an iPad with a speech application may make being understood easier and allow people with speech language disabilities to speak independently. I look forward to the program's continued success." "We are excited to host the new Voice Options communications pilot in Santa Clara County," said Sheri Burns, Executive Director of SVILC. "The ability for an individual with limited or no speech to try out one or more of these easy-to-use apps on an iPad, then borrow the iPad long-term is wonderful! The Voice Options program is opening up new doors and connections for lots of people in California." All program iPads are equipped with the following 5 speech apps: Go Talk NOW Plus; LAMP words for Life; Predictable; Proloquo4Text; and TouchChat. San Francisco, CA – The California Public Utilities Commission (CPUC) today launched an 18-month pilot speech technology program called Voice Options, which will offer iPads with speech applications to people with speech disabilities for short- and long-term loan through 10 demonstration centers throughout the state. Californians who are not able to speak or have difficulty speaking may borrow iPads with speech applications to determine if using an iPad increases their ability to communicate. All program iPads are equipped with the following speech apps: Go Talk NOW Plus, LAMP words for Life, Predictable, Proloquo4Text, and TouchChat. Individuals may borrow an iPad for up to 30 days to determine if using a speech app increases their ability to communicate. If the user determines a speech app on the iPad works well for them, they may apply for a long-term loan of the device and their favorite speech app. Long-term loans require a verification of disability status by a designated professional. The pilot program is associated with the passage of Assembly Bill 136 (Beall, 2011). It is administrated by the California Foundation for Independent Living Centers and funded through the CPUC's Deaf and Disabled Telecommunications Program. Individuals can participate in this program by visiting one of 10 Demonstration Centers operated by the California Foundation for Independent Living Centers in the following cities: Anaheim, Grass Valley, Los Angeles, Redding, Sacramento, Salinas, San Bernardino, San Diego, San Jose, and Santa Ana, or by visiting http://VoiceOptions.org, or calling toll-free (800) 390-2699, or emailing info@voiceoptions.org. For more information about the Voice Options, please visit http://voiceoptions.org. Sacramento – Sacramento CA (July 11, 2016) The California Foundation for Independent Living Centers (CFILC) is announcing the launch and Alternative Finance Program for Assistive Technology (AT) called the FreedomTech Financial Loan Program which will provide low interest loans to Californians with disabilities and their families who are interested in purchasing Assistive Technology. "Health insurance companies are covering less and less assistive technology and it is difficult to afford to buy, being able to get a loan offers another option to get access to critical technology that we need to live independently" explained Christina Mills, Deputy Director of CFILC. Financial loans may be used to purchase any device, item, or product that makes life easier for a person living with a disability or age related limitations. Wheelchairs, hearing aids, low vision aids, and computers etc. Loans may also be used in part to support the purchase of items for home and vehicle modifications. "CFILC is excited to provide a low-interest option to Californians with disabilities and their families. Whether someone wants to purchase a laptop for college, hand controls to modify a van, pay the share of cost for a new power-chair, buy hearing aids or build a ramp to their front porch, they can apply for a loan through our FreedomTech Loan program" said Teresa Favuzzi, Executive Director of CFILC. In addition to Assistive Technology loans, FreedomTech also provides Financial Literacy and credit building resources and assistance. Funding for the FreedomTech Loan Program was established by the U.S. Department of Education, Rehabilitation Services Administration. The California Foundation for Independent Living Centers is a non-profit advocacy organization whose mission is to increase access and equal opportunity for people with disabilities by building the capacity of Independent Living Centers. Hayward, CA – The Board of Directors of Community Resources for Independent Living (CRIL) is very pleased to announce that Ron Halog has been hired to serve as CRIL's next Executive Director. He will begin his tenure at CRIL on August 24, 2015. Ron's philosophy of empowerment and independence for individuals with disabilities has always resonated throughout the organizations and programs he has influenced. He comes to CRIL from Ala Costa Center, where he has been executive director for the past 10 years. As the Executive Director of Ala Costa Centers, Ron was able to expand the organization both in service delivery and financial security. Ron's leadership has resulted in Ala Costa receiving recognition for quality services from Parents Press (3 years in a row) and winning the 2011 Bernie Graff Award from the Alameda County Developmental Disabilities Council. In 2010, Ron was awarded a 2 year fellowship from LeaderSpring, an organization that supports executive directors in the non-profit sector. In addition, Ron chaired the Providers Vendors Advisory Committee (PVAC) last year and is currently on the Executive Team of the Alameda County Developmental Disabilities Council 2015. He is also is a member of the Functional Assessment Service Team (FAST) for Alameda County. Ron's most recently developed service is the Ala Costa Adult Transition (ACAT) program for the Berkeley Unified School District. He negotiated a contract to provide transitional services in the community, instead of in classrooms, for high school adults (ages 18 - 22) with developmental disabilities. Ron has served in the disability non-profit sector for over 25 years. He received his Bachelor of Arts in Recreation (with a focus in Therapeutic Recreation and Recreation Management) from California State University Long Beach. Upon graduation, Ron accepted the Recreation Supervisor position in the Long Beach office of Ability First. There, he ran an after-school program for participants ages 5 - 22 with developmental disabilities and a weekly evening program for adults. Within 3 years, he was promoted to Director of the Long Beach office. Throughout Ron's successful career in the non-profit sector, he has worked with organizations such as PARCA, Easter Seals Bay Area, and Mt. Diablo Vocation Services, in addition to Ala Costa Centers. As a native of CRIL's service area, Ron shares that he is "thrilled to be part of a dynamic team of people who make a difference in so many lives. Since the signing of the ADA, 25 years ago, there have been great strides in accessibility and services for people with disabilities. But there continue to be barriers that, as a community, we must overcome. We must all remember that disability rights are civil rights." As the new Executive Director of CRIL, Ron will strive to continue CRIL's 35 year legacy of quality services and advocacy focused on addressing the unmet needs in our community. Ron states, "I embrace the opportunity to support all of the people associated with CRIL. I am honored to share my 30 years of experience in the disability field." Today the BART Board voted to approve an agreement between BART and disability advocates to address concerns raised by disability organizations regarding the floor plan for BART�s Fleet of the Future. The Fleet of the Future is the name used by BART for the program to replace BART�s aging fleet, and increase the size of the fleet to relieve crowding on the system. The first new cars are slated to go into service in Fall 2016. This agreement was between BART and the following three disability advocacy organizations: the California Foundation for Independent Living Centers (CFILC), Community Resources for Independent Living (CRIL), the Independent Living Resource Center of San Francisco (ILRCSF), and two individuals: Nikki Brown-Booker and Reba Landry. These organizations and individuals have been represented by Disability Rights Advocates (DRA) � a nonprofit legal center - in reaching a compromise agreement with BART. Disability Rights California also participated in the negotiations. The agreement changes the floor plan on the new train cars to consolidate all wheelchair zones at the middle door of each new train car, which will allow passengers with more than one wheelchair user in their group to be closer together when they ride BART. Under the plan, BART also agrees to remove all floor-to-ceiling poles in the middle door area to maximize accessible paths. The new plan retains tripod poles at end doors for semi-ambulatory people with disabilities, senior citizens, and others who need extra stability as the train accelerates and decelerates. There will be signage on the outside of the trains showing which doors have parking areas for people who use wheelchairs, and which doors have bicycle parking. Under the agreement, BART and the disability organizations will work together to inform passengers with disabilities about the new floor plan, pictured below. The compromise agreement keeps the same number of seats, wheelchair areas, and bike areas as the floor plan approved by the BART Board in June 2014, and still maintains an almost 50% increase in priority seating for seniors and people with disabilities (shown in green above). Blind customers will always find priority seating immediately to their left as they enter the car. Los Angeles, CA – September 8, 2014 � The California Emerging Technology Fund (CETF) and partners California Foundation for Independent Living Centers, Families in Schools and Youth Policy Institute are hosting a �Affordable Broadband for All� Forum focused on improving affordable broadband access for low-income Californians, particularly students and People With Disabilities. More than 50 broadband advocates, including Los Angeles city and education leaders, community-based organizations and Internet service providers, are meeting in Los Angeles. Among the topics to be discussed is the Comcast proposal to merge with Time Warner Cable. Speakers include Ron Chandler, Chief Information Officer, Los Angeles Unified School District; Dixon Slingerland, Executive Director, Youth Policy Institute; Oscar Cruz, President and CEO, Families in Schools; Jo Black, Executive Director, Independent Living Resource Center Santa Barbara; Louis Herrera, Technology Chair, California Council for the Blind; Henry Contreras, California Foundation for Independent Living Centers, Monica Ratliff, Board Member, LAUSD; Veronica Melvin, President and CEO, LA�s Promise; and Carolina Hernandez, Program Director, Families in Schools. Los Angeles County is the least connected urban region in the state, and CETF and its partners recognize that it is not possible to close the Digital Divide in California or the nation without substantial improvement in getting more Southern California households connected to high-speed Internet. California and National Broadband Plan goals are for 80% home adoption by 2017 and 90% by 2020. (California is currently at 75%, Los Angeles County at 76% but polling shows little improvement in the past three years). Comcast has said if its proposed merger with Time Warner Cable and swap of Charter customers is approved, it will extend its affordable broadband program geared for families with K-12 students, Internet Essentials, to new customers in Southern California. The co-sponsors of the forum are calling on Comcast to improve the implementation of Internet Essentials and expand the program to include all low-income households, including People With Disabilities and low-income seniors. If the Comcast merger is approved as proposed, the company�s service area will include 87% of all California students on free-or-reduced lunch. Among LAUSD students, 76% qualify for free-or-reduced lunch. That means 500,000 students will become eligible for Comcast Internet Essentials $9.95 a month Internet service. �We urgently need federal and state regulators and policymakers to implement strategies to expand broadband access to all low-income residents. Using the merger review process is the most prudent and timely path towards meeting California and National Broadband Plan goal of 90 percent home broadband adoption by 2020,� CETF President and CEO Sunne Wright McPeak said. San Francisco and Sacramento, CA – August 7, 2014 � The California Emerging Technology Fund (CETF) and California Foundation for Independent Living Centers (CFILC) today are hosting a forum to identify new policies and strategies to get more Californians connected to broadband at home. More than 80 broadband advocates, including state and local officials, educators, community-based organizations and Internet service providers, are meeting in Sacramento. The forum was organized after a Broadband Adoption survey released last month by the Field Research Corporation, in partnership with CETF, found one in four Californians does not have a high-speed Internet connection at home. Several participants in the Sacramento forum are calling on the Federal Communications Commission and state regulators to use the mandated review process of recently announced mergers to require Internet service providers to improve and expand affordable broadband offers, including setting subscriber goals and accountability measures to reach acceptable performance levels. Also, current affordable plans do not include People with Disabilities, seniors, or low-income households without school children. �We urgently need federal and state regulators and policymakers to implement strategies to expand broadband access to all poor residents. Using the merger review process is the most prudent and timely path toward meeting the California and National Broadband Plan goals of 90 percent home broadband adoption by 2020,� CETF President and CEO Sunne Wright McPeak said. Four in 10 Californians with disabilities do not have access to high-speed Internet at home, according to the survey. With 60 percent of working-age persons with disabilities unemployed or underemployed, affordable universal access to broadband at home is crucial. Those without high-speed Internet access at home must deal with an obstacle course to reach public-use computers, which includes transportation barriers, lack of accessible software options and inaccessible locations. The mission of CETF is to close the Digital Divide in California by breaking down barriers to high-speed Internet access at home through its Get Connected! campaigns and other initiatives. The goal is to reach 98% of all residences with broadband infrastructure and to achieve 80% home adoption by 2017. This statewide goal can only be accomplished if the following specific hard-to-reach target communities achieve at least a 70% adoption rate: low-income populations, Latino households, rural communities, and people with disabilities. For more information, please visit www.cetfund.org and www.getconnectedtoday.com. The mission of CFILC is to increase access and equal opportunity for People with Disabilities by building the capacity of Independent Living Centers. For more information, visit www.cfilc.org. Sacramento – The California Foundation for Independent Living Centers is proud to announce that Executive Director Teresa Favuzzi was chosen to co-chair California’s Long-Term Services and Supports (LTSS) Advisory Committee. Ms. Favuzzi will be leading this important state committee with her colleague Derrell Kelch, Executive Director of the California Association of Area Agencies on Aging. The California Health and Human Services Agency and Department of Health Care Services (DHCS) have collaborated to establish this LTSS Advisory Committee to provide input on the Money Follows the Person Demonstration, called California Community Transitions (CCT), redesign the California LTSS infrastructure for Medi-Cal members and strengthen the Aging and Disability Resource Connection (ADRC) initiative, which serves all individuals in need of LTSS regardless of age, disability or income source. The LTSS Advisory Committee membership includes a cross-section of consumer representatives and designated representatives from a broad range of LTSS providers, including ADRCs, Area Agencies on Aging, Independent Living Centers, CCT lead organizations, regional centers, mental health providers, health plans, veterans services, public authorities, foundations, Community-Based Adult Services providers, Multipurpose Senior Services Program providers, housing representatives and associations and representatives from the California Departments of Aging, Developmental Services, Housing and Community Development, Rehabilitation, Social Services and Veterans Affairs. “I am pleased with all of the expertise and ground level home- and community-based service providers we have at the table. We expect to actively engage this advisory committee to drive the changing LTSS environment in the state,” said John Shen, Chief of DHCS’ Long-Term Care Division. “As DHCS redesigns LTSS to comply with new federal regulations and to integrate LTSS into managed care, we have an opportunity to build programs and provide services leveraging this group of advisors to guide policies and outcomes. We hope to accomplish the implementation of an innovative LTSS delivery system that will meet the needs of all the frail, elderly, disabled, vulnerable and underserved populations in California." Los Angeles and San Francisco, CA – The California Emerging Technology Fund is pleased to announce Youth Disability Rights Activist Damary Bustos is a 2014 Broadband Champion. Fifteen individuals are being recognized for their groundbreaking work and strong commitment to close the Digital Divide. The Champions were selected in consultation with dozens of broadband leaders, community advocates and state and local policymakers. The 15 individuals are featured in the California Emerging Technology Fund 2013-2014 Annual Report and will be recognized at events in San Francisco on March 27 and in Pasadena on May 19. "We congratulate Damary and all of the Broadband Champions. From Parlier to the Bay Area, from Hollywood to Humboldt, they are representatives of trailblazers who work throughout California and beyond to point the way for policymakers to understand the opportunities afforded by information technology and high-speed Internet access," said CETF President and CEO Sunne Wright McPeak. "The Champions also share the moral imperative not to leave anyone behind or offline. Each of these individuals inspires us to act to close the Digital Divide," she said. Photo of Damary Bustos and the full list of recipients are available on request. Born with cerebral palsy, Damary Bustos was told she would never walk or talk well enough to be clearly understood. One day she faced a crisis: The day before a Disability History Week presentation at a local high school, her translator backed out. Undeterred, she downloaded the app Verbally on her father?s iPad, which allowed her to click ?speak? and the computer recited the presentation aloud. The students thought it was so cool--and Damary?s life changed. ?Damary is a fantastic role model for youth, her eagerness to try new things and take on new challenges makes her a successful leader,? said Teresa Favuzzi, Executive Director of California Foundation for Independent Living Centers. Damary?s ability to communicate verbally and online has opened up her social world and led her to college. In addition, she has become a leader at Community Resources for Independent Living?s Disability Action Network for Youth and the California Foundation for Independent Living Center?s Youth Organizing! Disabled & Proud program where she organizes youth with disabilities to engage in the Disability Community through technology. Damary?s story underscores how access to broadband communication can open up new worlds and enable a remarkable young woman to be heard. Sacramento – The California Foundation for Independent Living Centers (CFILC) is proud to announce that it has received a $25,000 grant from The S.L. Gimbel Foundation, a component fund at The Community Foundation. CFILC will use the grant for our Youth Organizing! Disabled & Proud (YO!) program, which is designed to Connect, Educate and Organize youth with disabilities across California. YO! celebrated its fifth year this month engaging youth in community service, leadership and civic engagement. YO! offers year-long volunteer opportunities for youth with disabilities in local Independent Living Centers. Youth work on two public education campaigns that promote the teaching of Disability History in Schools and bullying prevention. Penelope DeMeerleer, Co-Chair of the YO! Youth Advisory Council said that “Being a part of YO! continues to play a HUGE part in my life, especially in my earlier years of young adulthood. YO! and our community has made me a better leader, a friend, a public speaker, advocate, and has given me the amazing opportunity to meet other members. Without YO! I wouldn't know about disability history, culture, community, advocacy and much, MUCH more!! YO! means Community!! The S.L. Gimbel Foundation joined Friends of Californians with Disabilities, Southern California Edison, The Safeway Foundation, U.S. Bank, the State Independent Living Council and the Department of Rehabilitation in supporting Youth Organizing! Disabled & Proud. The California Foundation for Independent Living Centers is honored to receive this grant and want to thank The S.L. Gimbel Foundation for their generosity and recognition of this highly valued program. Sacramento – The California Foundation for Independent Living Centers is proud to announce that it has received a $3,000 Quality of Life grant from the Christopher & Dana Reeve Foundation. The award was one of 102 grants totaling over $500,000 awarded by the Reeve Foundation to nonprofit organizations nationwide that provide more opportunities, access, and daily quality of life for individuals living with paralysis, their families, and caregivers. Created by the late Dana Reeve, the program has awarded 2,307 grants totaling over $17 million since 1999. Maria is a mother and co-founder of the Low-Income Self-Help Center in the Bay Area. She is described by her colleagues as having an indomitable spirit; truly epitomizing the heart and soul of their group. Community members depend on her in different ways—she is the building maven, she shops and cooks for all of the center’s events, and does outreach, organizing and fundraising. She traverses all over the city selling raffle tickets and candy for different causes. And, she does all of this while experiencing significant leg pain. Maria eventually found a used scooter to help her get around the city. Unfortunately, one day Maria was hit in a crosswalk and her scooter was completely demolished. Luckily, the Center for Independent Living (CIL) applied to our repair fund and was able to give Maria another refurbished scooter for free. The Christopher & Dana Reeve Foundation have joined alongside Anthem Blue Cross, Clearing House Community Development Financial Institution and Batteries Plus Bulbs in financially supporting the Keep the Wheels Rolling Repair Fund. The California Foundation for Independent Living Centers is honored to receive this grant and want to thank the Christopher & Dana Reeve Foundation for their generosity and recognition of this highly needed project. I am pleased to announce the California Governor's Office of Emergency Services (Cal OES) application process to integrate disability representatives on Emergency Function (EF) workgroups. Each EF is led by a State Agency and is designed to bring together discipline specific stakeholders to collaborate and support all phases of emergency management: prevention, preparedness, response, recovery, and mitigation. Therefore, we are expanding the California EF workgroups to include representatives from the disability communities. Photo of California Secretary of State honors CFILC for Voting Advocacy on behalf of people with disabilities. Front: Ana Acton and Christina Mills. Back: Ted Jackson, Secretary of State Debra Bowen, Teresa Favuzzi, and Dolores Tejada. 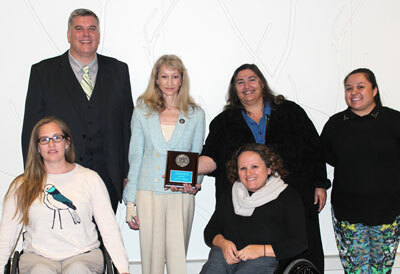 Oakland and Sacramento – California Secretary of State Debra Bowen honored the California Foundation for Independent Living Centers (CFILC), with a National Association of Secretaries of State (NASS) Medallion Award for outstanding advocacy on behalf of voters with disabilities. . The NASS Medallion Award allows individual Secretaries of State to recognize outstanding service and dedication to furthering the mission of the NASS within the states. "CFILC has been an extraordinary partner in working to make democracy equally accessible to voters with disabilities," said Secretary Bowen, California's chief elections official. "CFILC's tireless commitment to building an accessible elections process and organizing voter education, registration and voting opportunities for people with disabilities epitomizes the very heart of the NASS Medallion Award." Secretary Bowen presented the award at CFILC's statewide Board of Directors meeting, held at the California Endowment offices in Oakland on Monday, October 14, 2013. Teresa Favuzzi, CFILC's Executive Director, has guided the organization's voting campaigns for over a decade, "Through our Disability Organizing Network (DOnetwork) Independent Living Centers have focused on building the Disability Vote, by increasing access to polling places and voting machines, and by organizing voter education forums, and motivating voters with disabilities to vote on Election Day." CFILC's voting work is driven by the community organizing efforts of the Disability Organizing Network supporting forty Independent Living Center (ILC) staff and nearly 800 volunteers from across California who seek to build accessible communities through grassroots campaigns, www.DisabilityOrganizing.net. "In 2012 we increased voter registration and education opportunities for people with disabilities being served by ILC's. And we are planning to broaden the network?s voting campaign to increase overall disability community participation in the 2014 election,' remarked Ted Jackson, CFILC?s Statewide Organizer. CFILC is an advocacy organization made up of 22 of the 28 ILC's in California and also supports the Assistive Technology Network (ATNetwork) and Y.O! (Youth Organized) Disabled & Proud. For more information about CFILC programs please visit www.CFILC.org. San Francisco and Sacramento – The California Emerging Technology Fund (CETF) and California Foundation for Independent Living Centers (CFILC) on Tuesday are launching a new statewide partnership to help improve the lives of Californians with Disabilities by providing access to affordable Internet service at home, low-cost computing devices and Digital Literacy training. WHAT: CETF is announcing a 2-year, $260,000 grant to CFILC to launch Digital Access, an unprecedented initiative to connect people with disabilities and their families to affordable high-speed Internet at home and the tools they need to succeed in the Digital Age. Digital Access will engage 40 organizations statewide to help more than 2,100 people with disabilities and their families subscribe to discount broadband at home. WHO: CETF President and CEO Sunne Wright McPeak and CFILC Executive Director Teresa Favuzzi will meet with Executive Directors of Independent Living Centers from around the state to describe the initiative. Highlights include: Independent Living Centers and Assistive Technology Network Device Lending Libraries will assist consumers to obtain affordable computing devices; and CFILC will identify and promote a network of computer labs and training sites that provide easy accessibility. People with disabilities will be available for interviews. Tuesday, October 15, 2013 - 11:30 A.M.
WHY: The mission of CFILC is to increase access and equal opportunity for people with disabilities by building the capacity of Independent Living Centers. CETF provides leadership statewide to close the Digital Divide by accelerating the deployment and adoption of broadband to underserved communities. Slightly more than half of Californians with disabilities have access to high-speed Internet at home, according to recent polling. With 60 percent of working-age persons with disabilities unemployed or underemployed, affordable universal access to broadband at home is crucial. Those without high-speed Internet access at home must deal with an obstacle course to reach public-use computers, which includes transportation barriers, lack of accessible software options and inaccessible locations.